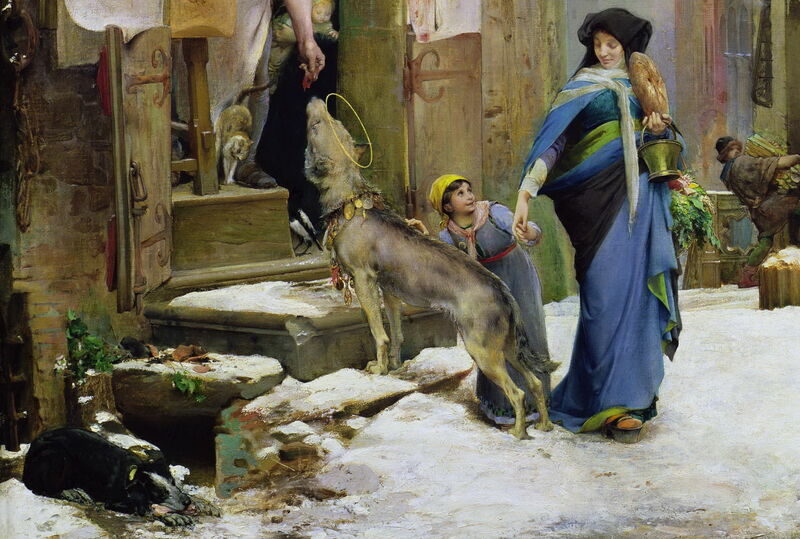 Luc-Olivier Merson (1846–1920), The Wolf of Agubbio (detail) (1877), oil on canvas, 88 x 133 cm, Palais des Beaux-Arts de Lille, Lille, France. Image by Chatsam, via Wikimedia Commons. Around 1206, the small town of Gubbio, perched on the lower slopes of the Apennine Mountains in central Italy, was troubled by a predatory wolf. It was winter, and the wolf was driven by hunger to feed not only from local flocks of sheep, but had started to attack people too. Living in the town at the time was a young man from Assisi, Giovanni di Pietro di Bernardone, known to everyone as Francesco. He seemed to have a way with animals, and when he heard of the rising concerns about the wolf, he decided to go up into the woods and pastures to find it. He had trudged for some distance over the snow-covered hills when he came face to face with the beast. Francesco made the sign of the cross, and told the wolf to come to him, which it did, as meek as a lamb. He then led the wolf into Gubbio, and surrounded by astonished locals, Francesco made a pact between the townspeople and the animal. As the wolf had been driven by hunger to do evil, the citizens would feed the wolf regularly so that it was no longer hungry. In return, the wolf would no longer attack them or any of their animals. The deal even extended to the local dogs, who would not trouble the wolf again. As a mark of this agreement, and so that the townspeople could recognise ‘their’ wolf, Francesco blessed it. I’m sure that you recognised the hero of this brief legend as the future Saint Francis of Assisi, and perhaps the source of the story as the Fioretti or Little Flowers, a compilation of such tales which grew after the saint’s death in 1226. 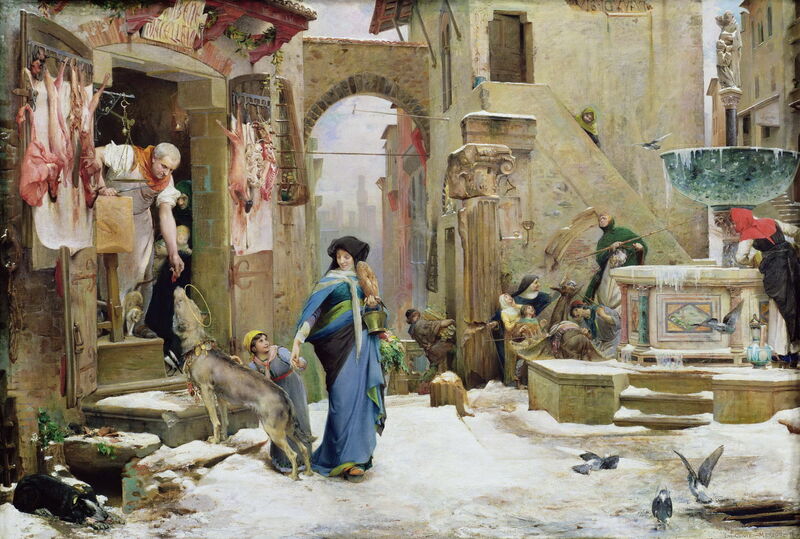 You probably won’t recognise this wonderful painting of The Wolf of Agubbio (1877) though, or its creator, Luc-Olivier Merson (1846–1920). Set in the town’s central piazza, it is a cold winter’s day, so cold that the waters of its grand fountain are frozen as they cascade over its stonework. As the townspeople go about their business, there is a large wolf with a prominent halo standing at the door of the butcher’s shop. Leaning out from that door, the butcher is handing a piece of meat to the wolf. A young girl smiles open-mouthed as she strokes the wolf’s back. Her mother holds her other hand, as she walks back clutching a loaf of bread and other provisions. The wolf appears lean but far from starving. Around its neck, worn like a collar, are various metallic charms and coins. A black dog nearby keeps a watchful eye on the wolf, but remains resting on its snow-free patch of ground. In the details are a menagerie of creatures: five pigeons, a magpie in the entrance to the butcher’s, a donkey, horse, the black dog, and a cat. There are also more than a dozen people, carrying firewood, watching the flying pigeons, and so on. Merson dedicated this painting to his friend, collaborator, and former pupil, Adolphe-Paul Giraldon (1855-1933). Merson was born in Paris in 1846, and studied first at the École de Dessin, then at the École des Beaux-Arts in the city. He exhibited at the Salon from 1866, and in 1869 won the prestigious Prix de Rome. He spent the next five years in Italy, returning to Paris by 1875. The Wolf of Agubbio was most probably painted from sketches and studies which he had made of the town when based in Rome. 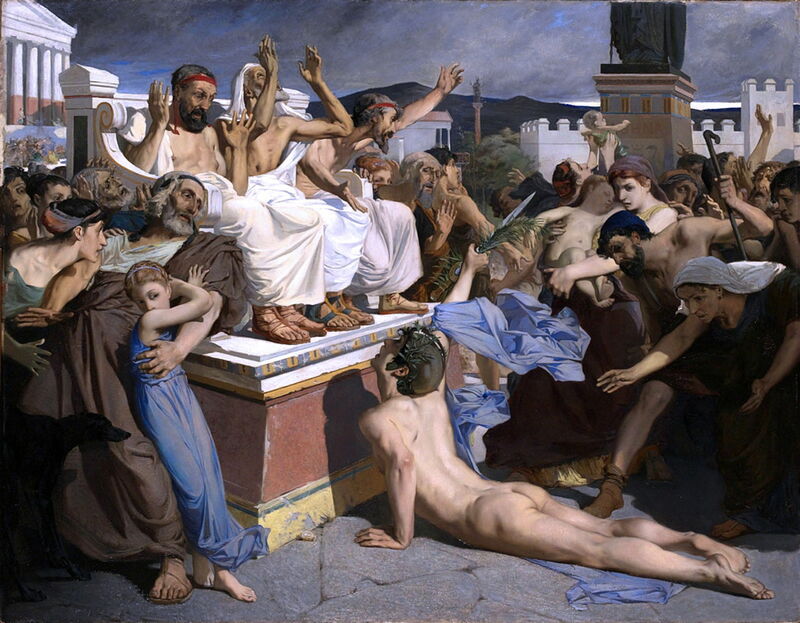 I suspect that the painting which won him the Prix de Rome is The Soldier of Marathon (1869). Pheidippides (or Philippides), seen collapsed on the ground, is the legendary soldier who was said to have run from the scene of the Battle of Marathon (490 BCE) to Athens, to announce the victory of the Greeks over the Persians. Almost certainly a more modern romantic invention, this story forms the basis of the modern marathon, although Pheidippides’ fate is usually glossed over: according to that legend, once he had completed his mission and announced the news in Athens, he died of exhaustion. 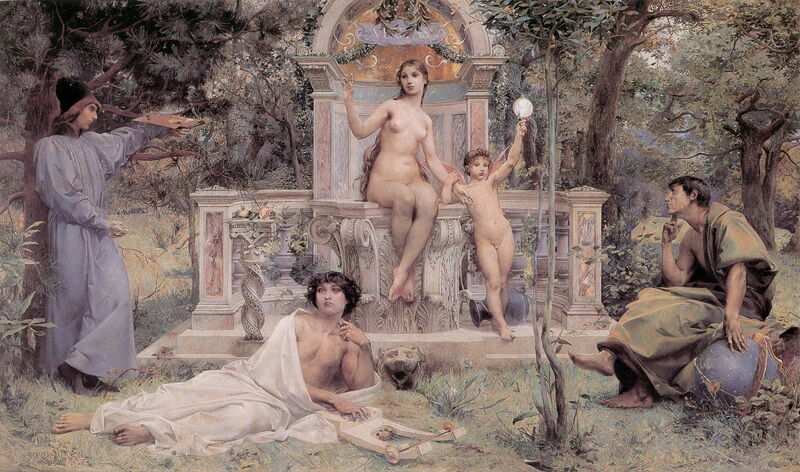 Luc-Olivier Merson (1846–1920), The Vision (1872), oil on canvas, 290 x 344 cm, Palais des Beaux-Arts de Lille, Lille, France. Wikimedia Commons. Some of Merson’s paintings are almost phantasmagoric in their content. 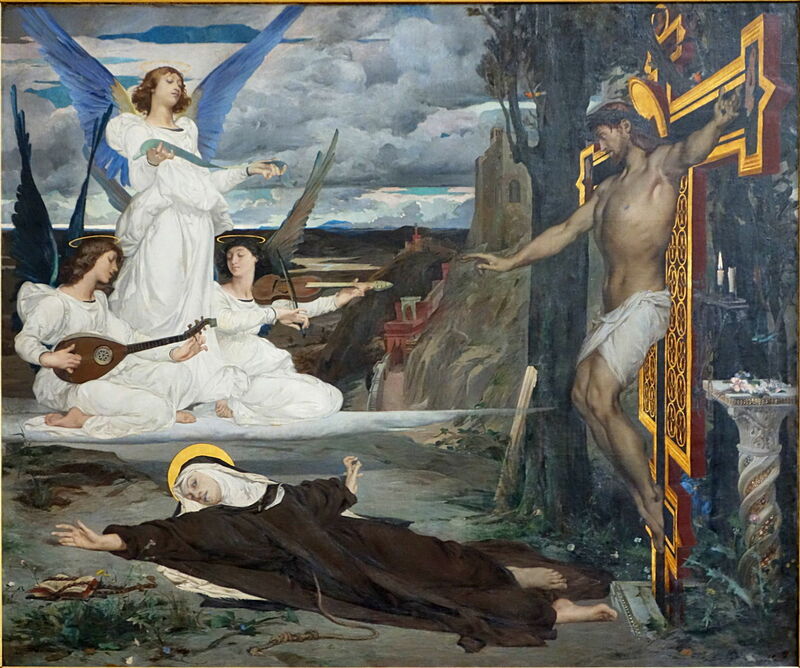 The Vision (1872) combines an altered image of the crucifixion with that of a nun in an apparent ecstasy, and an angelic musical trio. I’m sure that there is a story behind this, although none springs to mind. It is also highly suggestive of the much later paintings of surrealists, particularly some of Salvador Dalí (1904-1989). Luc-Olivier Merson (1846–1920), Rest on the Flight into Egypt (1880), oil, dimensions not known, Museum of Fine Arts Boston, Boston, MA. Wikimedia Commons. Merson was skilled at taking traditional if not hackneyed stories and reinventing them in haunting images. 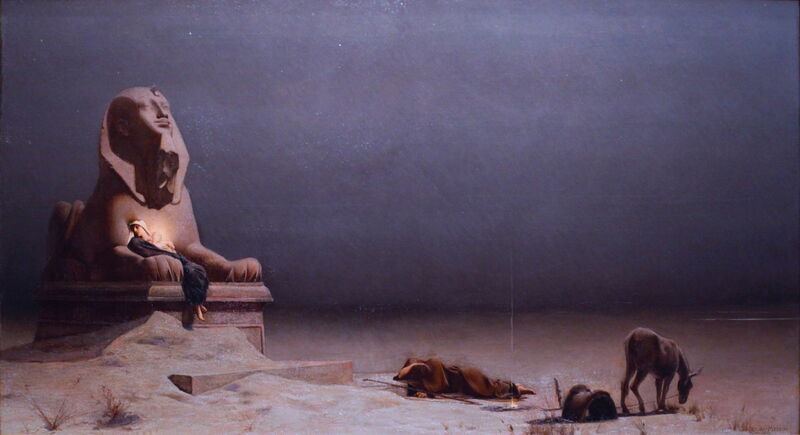 His version of the Rest on the Flight into Egypt (1880) shows the Virgin Mary cradling the infant Jesus at the foot of a sphinx, whose head is turned up to stare at its vast nighttime sky. Towards the end of the nineteenth century, Merson was a central figure in the development and popularisation of Art Nouveau. Together with his friend and former pupil Adolphe-Paul Giraldon, he contributed to the monthly magazine L’Estampe moderne, published from 1897-99, each issue of which brought four original Art Nouveau lithographs. Luc-Olivier Merson (1846–1920), Truth (1901), oil on canvas, 221 x 372 cm, Hotel Watel-Dehaynin, Paris. Wikimedia Commons. Gone then were the sparse images of the past, and his painting of Truth (1901) is full of ornate Art Nouveau decoration. The personification of truth here sits naked as the day she was born, under the Latin inscription for truth, veritas. At the left is the artist with palette and brushes, below the musician and poet with a lyre, and at the right the scientist-philosopher with his globe of the stars. 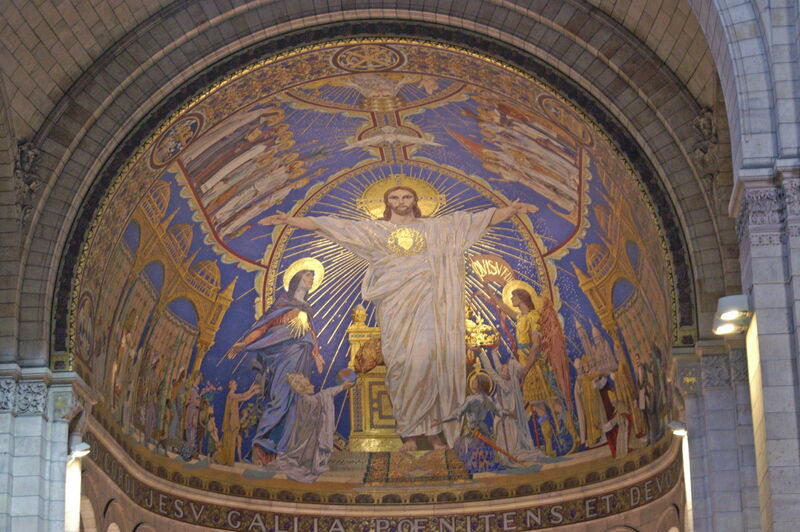 Luc-Olivier Merson (1846–1920), Christ in Majesty (date not known), mosaic, dimensions not known, Basilique du Sacré-Cœur de Montmartre, Paris. Image by Didier B, via Wikimedia Commons. The one place which you may have visited and seen Merson’s work is the Basilica of the Sacred Heart (Sacré-Cœur) of Paris in Montmartre, in Paris. His breathtaking mosaic of Christ in Majesty (c 1890-1910) in its apse is among the largest in the world. Luc-Olivier Merson did much more, including designing stained glass windows, and from 1900 was responsible for the designs of many postage stamps and banknotes. But I will always associate him with the story of Saint Francis of Assisi and the wolf of Gubbio. Posted in General, Life, Painting and tagged art nouveau, Dalí, Giraldon, Merson, myth, narrative, painting, Saint Francis. Bookmark the permalink.